"Perhaps it was Sithis who crumbled our stone hearts. Perhaps it was the Hist, who longed for our company, for the patter of our feet atop their roots." Pre-Duskfall, its theorized ancient Argonian society was more advanced and unified. Another possibility is, that the ancient Argonians' trade connections simply reached farther than what was believed. The ancient Argonians were adept at metalworking and often used volcanic glass in their weaponry. Some of their work was even possibly inspired by Dwemer designs. 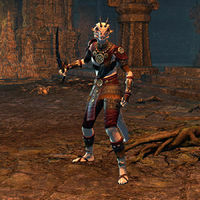 Ancient Argonians viewed Sithis as a destroyer and feared its destructive force. Thus, among other things, they built vast stone pyramids, known as xanmeers, to stand against the destruction. Fearing Sithis to this extent could explain why the old priests of Sithis were able to retain a power position in Argonian society and reign as kings in the pre-Duskfall period. Sithis had a more central role in this old society, and the ceremonies dedicated to Sithis were also different, including blood sacrifices. Not surprisingly, there was resistance to Duskfall among the Sithis priesthood, some of them taking to extreme measures. One priestesses of Sithis named Shuxaltsei managed to return briefly in 2E 583 and attempted to reclaim her temple in Murkmire..
Tsofeer cavern, Tomb of Many Spears, Xinchei-Konu monument and the Teeth of Sithis are examples of buildings from pre-Duskfall era. Xinchei-Konu was an ancient calendar that shows how the Argonians viewed time and tried to fight against the change, for example by manipulating weather. The Teeth of Sithis on the other hand is an old temple of Sithis and possibly the largest known. Several relics from pre-Duskfall or Duskfall can be found in Black Marsh, some of them dangerous. One pair of such relics is the Fangs of Sithis, which could be used for mass destruction, turning crops into ash and creating undead horrors from the living. However, using the Fangs of Sithis is said to consume one's soul, driving the wielder mad. In 2E 582, the Fangs of Sithis were discovered deep inside the Sunscale Strand ruins in Shadowfen, Black Marsh. The Cyrodilic Collections society aims to research and recover such relics and return them to Argonians. In 2E 583, a former member of the society travelled to the island of Norg-Tzel to pursue another of such relics – the Golden Skull of Beela Kaar, an ancient Argonian sorcerer who practiced dark arts. The relic was said to contain the power of Beela-Kaar himself, vibrating with arcane energy and carrying a terrible curse. This page was last modified on 28 November 2018, at 23:58.